« PODS Takes the Stress Out of Moving and Storage both Locally and Long-Distance! The success of mowing your lawn after prolonged storage hinges on the preparations you took beforehand. Whether you’re storing your lawn mower and garden equipment in the winter or you’re in the midst of relocation, properly preparing your gardening tools for hibernation is crucial to their longevity. First, thoroughly clean everything. Scrape excess dirt and grass from the mower deck’s underside to prevent corrosion. Then, thoroughly rinse the deck with a garden hose. This process becomes much more difficult when dealing with a large lawn tractor. Purchase an auto ramp to access the tractor’s underside much easier. When the deck is meticulously cleaned and dried, ConsumerReports.com suggests applying a coat of silicone spray to the deck to reduce grass clipping buildup when your mower is next used. This is also an ideal time to sharpen the mower blade in preparation for the next time its blade strikes grass. Use a scrubbing pad and warm water to extract caked dirt from other garden tools. The same preparatory steps apply to your trimmer, tillers, leaf blowers and various Husqvarna products for lawn and garden care. 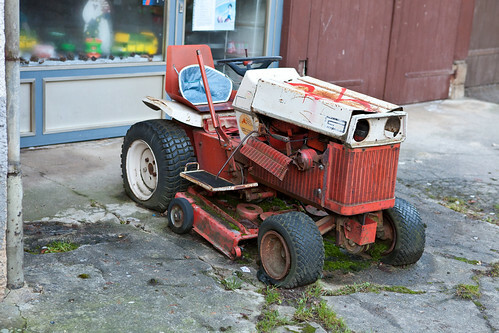 Remember to ensure your mower and all tools are completely dried to reduce chances of rust. During winter, add stabilizer to your fuel. Without it, gasoline oxidizes and causes deposits that clog the carburetor and inhibit ignition, according to ConsumerReports.com. You can find stabilizers at any home improvement or garden stores. After allowing the engine to run for a few minutes, stabilized fuel will have reached the carburetor and should prevent fuel oxidization for up to one year. Inspect the mower’s electrodes for decay and deposits — if electrodes are extensively weathered, it’s best to replace the spark plug altogether. To maintain the engine’s integrity throughout winter dormancy, apply a few drops of fogging oil into the cylinder. Yank the ripcord a couple of times and reconnect the plug. Storing the starter batteries of tractors or riding mowers for the winter is as simple as removing, charging and storing it inside a shed or storage facility. While in storage, recharge the battery at least once more for enhanced protection. Depending on its age, the mower battery may be losing its ability to hold a charge. Though this storage advice is for applicable for winter storage, much of it also applies to storing your lawn equipment at a storage facility. Maybe you’re in between homes or moving into an apartment or townhouse where lawn equipment isn’t necessary, so you’re using a facility to temporarily house your equipment. Storage prep — and occasional maintenance — is important to your tools’ durability and your own preparedness for post-storage use. ManVsTool.com suggests cloaking your tools with a tarp and keep tools elevated and cool. In addition, apply oil or rust preventative fluids on bare metal components for continual conservation.